/usr/share/zoneinfo 에 미리 저장 되어 있다. for errors and problems arise. SSM can assist with this. In upstream development news, the kernel team here at Red Hat has been working on a dynamic kernel patching project called kpatch for several months. At long last, the project has reached a point where we feel it’s ready for a wider audience and are very excited to announce that we’ve released the kpatch codeunder GPLv2. 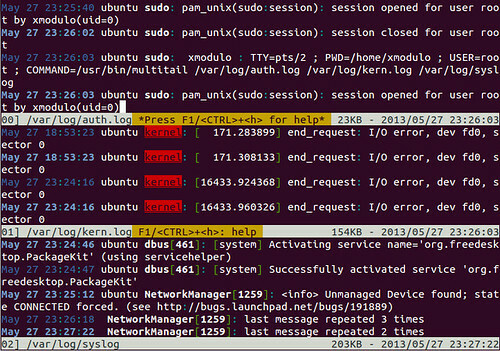 kpatch allows you to patch a Linux kernel without rebooting or restarting any processes. This enables sysadmins to apply critical security patches to the kernel immediately, without having to wait for long-running tasks to complete, users to log off, or scheduled reboot windows. It gives more control over uptime without sacrificing security or stability. kpatch-build: a collection of tools which convert a source diff patch to a hot patch module. They work by compiling the kernel both with and without the source patch, comparing the binaries, and generating a hot patch module which includes new binary versions of the functions to be replaced. hot patch module: a kernel module (.ko file) which includes the replacement functions and metadata about the original functions. kpatch core module: a kernel module (.ko file) which provides an interface for the hot patch modules to register new functions for replacement. It uses the kernel ftrace subsystem to hook into the original function’s mcount call instruction, so that a call to the original function is redirected to the replacement function. kpatch utility: a command-line tool which allows a user to manage a collection of hot patch modules. One or more hot patch modules may be configured to load at boot time, so that a system can remain patched even after a reboot into the same version of the kernel. If you’d like to learn more about kpatch, check out the kpatch github project. For the adventurous, there are even installation and quick start instructions for Fedora 20. Better yet… we’d love for you to get involved and contribute to our collective efforts. LVM2 최근 버전(2.02.89)에서는 thin 볼륨을 지원합니다. thin 볼륨을 구성하기 위한 Pool을 구성하고 풀에 있는 thin 논리 볼륨은 오버 커밋 이 가능합니다. 즉, 할당한 크기보다 나타난 크기가 클 수는 있습니다. 풀 자체 크기보다 클 수도 있습니다. LVM에서 각각의 thinpood은 특별한 형식의 논리 볼륨이며, 논리 볼륨을 자체적으로 제공할 수 있습니다. 경고 – thinpool 메타데이터에서 오버플로우가 발생하면 풀이 깨집니다. LVM에서는 이러한 현상을 복구할 수 없습니다. 참고 – thinpool 의 용량이 고갈되면 pool 을 확장하거나 더 많은 공간을 할당 하기위한 프로세스의 의해 pool SIGKILL 상태가 될 수 있다. 각각의 thinpool 에는 관련 메타데이터가 있으며, thinpool 용량에 추가됩니다. LVM에서는 크기가 어떻게 되든지간에 최소한 pool_chunks * 64 bytes 또는 2MiB 만큼 thinpool 크기를 기반으로 메타데이터 크기를 계산합니다. 관리자는 마찬가지로 메타데이터 크기를 달리 선택할 수 있습니다. RDMA over Converged Ethernet, or RoCE), and SRP (Mellanox InfiniBand). T he targetcli shell provides the general management platform for the LIO Linux SCSI target. kernel-debuginfo 패키지를 설치하면 /usr/lib/debug 폴더에 crash 분석을 위한 파일들이 설치된다. PID: 32593 TASK: ffff880c0e1d4ac0 CPU: 2 COMMAND: "bash"
If you are a Linux system administrator, monitoring log files on a server host will be one of your daily routines. The tail command comes in handy as you can monitor a log file in real-time as it grows, by running tail with “-f” option. 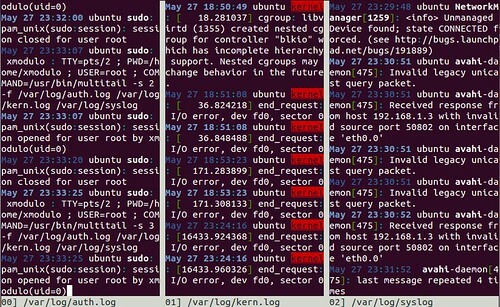 What if you want to monitor more than one log file at the same time? You could run tail on multiple terminals, or launch multiple instances of tail in one terminal by using terminal multiplexers such as screen. But neither approach is convenient in monitoring mupltiple log files at once. In this post, I will describe how to tail multiple files at once in Linux, by using a command-line tool called multitail. multitail creates ncurses-based multiple screens inside a terminal, each of which can run a separate instance of tail-like file viewer. Besides tailing log files, multitail can also monitor the output of an external command, as the execution of the command is in progress. 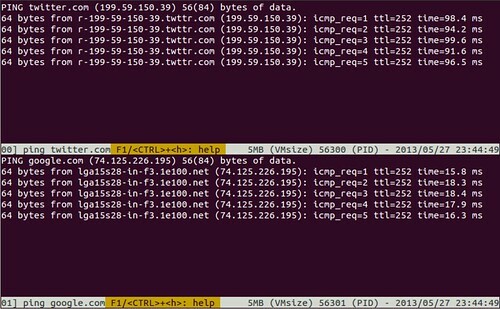 For example, you can run multiple ping commands, and monitor individual ping outputs simultaneously in split screens as follows. If you made changes in udev rules, you might want to reboot to apply the changes. But, there’s a simpler method than system reboot. It depends which version you are using. I’ll put RHEL5 and RHEL6 commands which might cover most scenario.